The funniest thing happened over dinner the other night. We had friends over the day after Christmas and I served Amara and their little boy sparkling apple cider out of champagne glasses. Sparkling apple cider is one of those special treats I like to get for Amara. She asked why I was using different glasses. I usually give hers to her in a plastic champagne flute that is left over from our wedding six years ago. I used to have quite a few of them but over the years they have either cracked or sprung a leak. I told her I only had one of those left so I was trusting the two of them to use my two good ones. These are my “good ones”. A friend gave them to us filled with M&Ms for New Year’s 2000. That is the good china behind the glass. This somehow got her talking about how and when we had started the tradition of her drinking sparkling apple cider out of those plastic glasses. She was pretty sure we had started it on New Year’s Eve. She told our friends “I’ve spent every New Year’s Eve with Grandma and Grandpa except one.” I think Amara remembers my post from last year. She just put her head back and laughed! So did the rest of us! 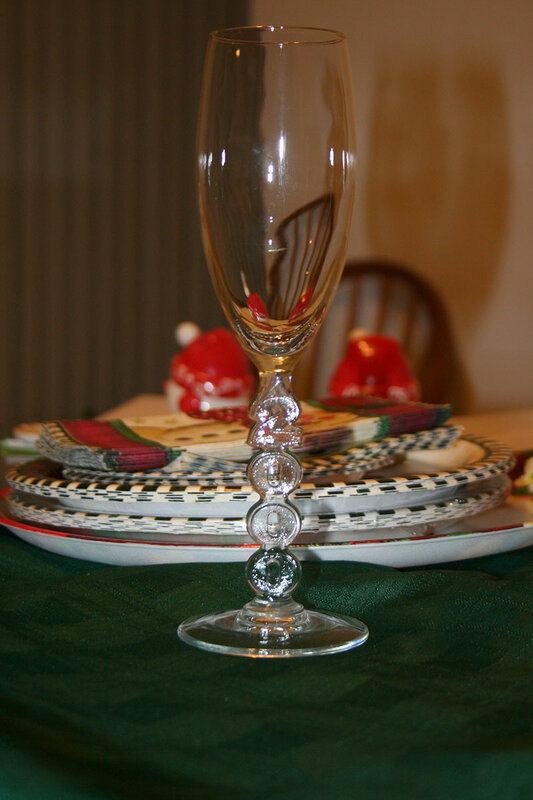 This memory was posted in Special Occasions and tagged Amara, New Year's Eve, sparkling cider on December 30, 2011 by Grandma Kc. happy new year and big hugs!!! Ha! Yep, I bet 2003 is the one and only. Funny girl! I love the sparkling cider tradition. Love your “good” china even more! You’re my kind of grandma! Happy New Year to you, Grampy, and Amara, along with everyone else in Amaraland! Happy New Year. Cheers for the sparkling cider. That is so funny! Technically she’s right. She didn’t spend New Year’s Eve with you in 2003. I have identical champagne glasses, but I don’t know where they are. I should look around and see if I can find them before tomorrow night. We’re starting the tradition of keeping the grands for NYE this year. Their parents will be able to go out and party. We don’t go out anyway, so it’s a win-win. We’re calling it Grams & Pop-Pop’s Rockin’ Toddler New Year’s Eve. Love your china pattern, looks just like mine. Love the story. 2003 indeed. Wishing you a year of wonderful Amara moments . Cute story! I also have that same set of “good” crystal glasses with the year 2000 on the stem and like Grams, I should try to dig them out. It will be unusual for me this year as my two grandsons are on a birthday trip with their parents for the weekend, so I shall be grandkid-less this New Years for the first time in 4 years. But I love your past post showing Amara celebrating every January! Happy New Year to your family and as always, thanks for sharing. What a cute reminder that time has a different meaning for children. Which, I guess, is why they think grandparents lived in the era of dinosaurs! At the very least I am sure Amara thinks we lived in a black and white world, before color was invented — she has been looking at pictures of me when I was little and they’re all in b & w.